All new remodel among an acre of tropical fruit trees. Views of Mauna Kea . It really doesn't get any better than this in paradise. We have just completed this remodel to give guests a feel of old Hawaii but in the luxury of high end amenities throughout this duplex. Covered lanais are off each bedroom with sliding door access. The walk in shower has a European panel design with 6 massage jets. All modern, new electric kitchen, free wi Fi and large flat screen TV with Direct TV. We can accept children 10 years of age and older. My husband and I met in Alaska 30 years ago. He was a teacher and I owned a holistic health center. We stayed there 18 years until the tropics called (and we were able to retire).Our 1st home was in lower Puna at Kehena Beach. We lived there and had vacation rentals there before moving to Hilo 3 years ago. Phil spends a lot of his time volunteering in politics. I spend mine in the garden and gleaning fruit from our trees and making wine among other things. We both paddle in outrigger canoe clubs and enjoy our 2 big lab pups that are growing quickly. These are 2 duplexes which have the old Hawaiian character of single wall redwood and cedar architecture of the sugar cane days. We could see the potential if doing total high end remodels to all of them. The location doesn't get any better. Walk into town across the river in 5 minutes. Who needs a car ? The acreage boasts a variety of fruit trees which guests can pick from when in season. Agricultural fields are on 2 sides of the property and our home on the other. It is a very quiet and serene location. There is a loop driveway in and out of the property with easy open latch gates that we close late at night and open early in morning mainly to keep the occasional feral pig out. They do enjoy the fruit too. When it rains hard you can also hear the nearby Wailuku River roaring. The bath is modern with luxurious features abounding. The large skylight lets in plenty of light. A custom tile shower with beach rock style floor and glass blocks in the wall create an open flow and spacious feel. The 10 head shower gives multiple options for shower massage or just relax under the large rainfall shower head. All cotton high thread count linens. Two love seats and tables. Fully stocked kitchen with new cabinets and appliances. Dining table and 4 chairs in the great room. Music channels on Direct TV. 2 courses available within 4 miles. The unit was well appointed and clean. Very comfortable, and a quick walk into town. Everything we needed was there: beach towels and chairs, coolers, laundry facility, etc. Diane is a lovely person. The only negative is that the walls are thin, so we could hear our neighbors talking. It didn't really bother us that much. This place is perfect for us. Lots of room and a killer view of Mauna Kea. Wonderful happy hours on the lanai. Walking distance to downtown shops, restaurants and the Farmer's Market. Diane is very responsive and helpful. We highly recommend Paradise Found. The accommodations are top notch! Very up to date and the bathroom is gorgeous! A very quiet and tidy place to stay with new appliances. Property is beautiful... one suggestion would be to replace the bbq which is quite rusty but the hosts may already be planning to do that. We liked the interior layout of the house and particularly liked the fact that it adjoined a farm field on one side of the house. 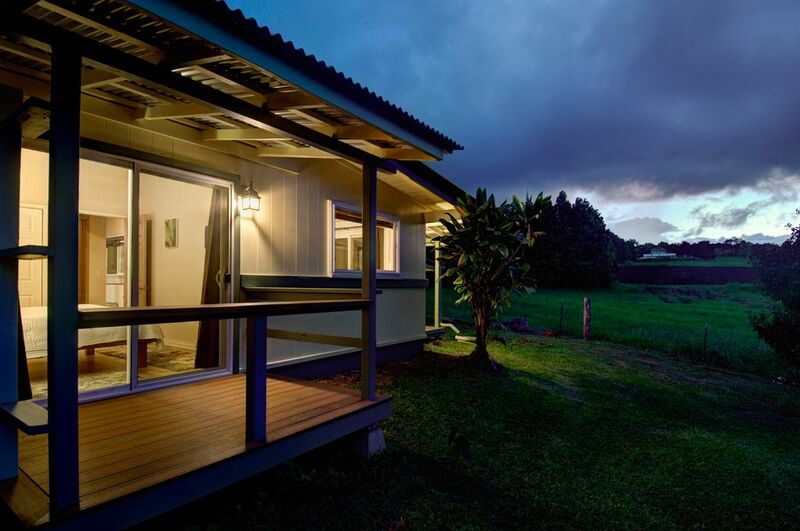 The location was quiet (no chickens crowing), and convenient to the Hilo waterfront. The "house" is half of a duplex. We really enjoyed our stay at Paradise Found, downtown Hilo. The house was great and well appointed. It met our every requirement. Very nice surroundings and friendly owners that live nearby. Got to meet a nice family Labrador. The place stayed cool on the warm days because of good ventilation. Hilo itself and the "Hilo side" of the island were fantastic. Very happy with Paradise Found. Hilo is a great destination. Tours to Mauna Kea Observatory and live volcano viewing . Children 10 and over Full refund with 60 days or more cancellation notice A credit card can be used to secure damage deposit after arrival. Ask about 2018 Merrie Monarch rates and Christmas rates.